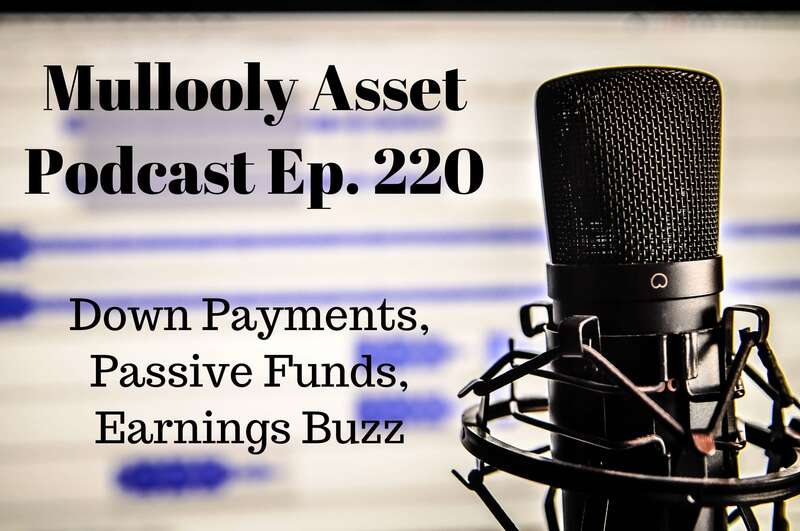 Tom Mullooly: Welcome to the Mullooly Asset Management podcast. I’m Tom Mullooly. I’m here with Brendan Mullooly, and we were just talking about the benefits of Rook Coffee. Tom Mullooly: Which is local here in New Jersey. Brendan M.: My favorite coffee place. Look, coffee is coffee, but they are number one in my book. I don’t know what they do, but it’s smooth and I definitely get a little jolt from it, which is nice. Tom Mullooly: And they’ve got T-shirts and bumper stickers and all kinds of things. Brendan M.: Yeah, I’ve got a magnet on my car, and I wear their shirt out and about. Tom Mullooly: So Brendan, to steal like a line from Meet the Fockers, you’re a homeowner, right? Tom Mullooly: So, a story in MarketWatch this week, the title was “Renters, this is how many years it takes to save up for a down payment on a home.” Basically, if you’re thinking about buying a home in San Jose, California, don’t. Just don’t. Brendan M.: You can buy a shed for a million dollars, I think. Tom Mullooly: It’s out of whack. But a new report from Zillow said that if you’re looking to put 20% down on the median value home in the United States, which is $216,000 … To put 20% down, most people, it would take them about 77 months, or about six and a half years, to build that 20% down. Brendan M.: So we’re working with averages here, so we’re assuming that that home price is … For example, I know that that’s not really going to get you much here in our area in New Jersey, or out in California. We’re also working with averages in the sense of, I guess, what they’re assuming people are able to save, ’cause if you make a lot of money, you could save … Like, if you’re trying to save $40,000 to put down 20% on a $200,000 house, then you could do that easily if you make $250,000 a year. Brendan M.: But if you make $50,000 a year, different story. Tom Mullooly: And that’s each where this story was coming from, because they used the national median income. Tom Mullooly: Which was a little over $56,000. It’s going to take a while. Brendan M.: That makes total sense, and if you’re renting and rent is coming in somewhere between … Let’s say for a lot of people, it’s maybe between 20-30% of their income goes towards housing and expenses. So if you’re spending that on something like rent, and then you’re working with what’s left over to buy groceries and pay for other things like necessities, and then you’re trying to save not only for a down payment, but maybe retirement or school for your kids ..
Tom Mullooly: It’s a lot. Brendan M.: And it could be a small amount that you end up being able to set aside each month for a down payment, and if you’re only setting aside a few hundred dollars a month, it’s going to take you a while to save $40,000. Tom Mullooly: The financial planner in me says there’s probably an article out there that says you should probably skip the $4 lattes at Rook Coffee or Starbucks or wherever. We see them crop up every couple of weeks online with the different websites that we go to, but is there really … We’re getting a little off topic, but is that really something that is going to add up? Is that going to be significant? Brendan M.: Maybe not, if we’re just talking about a cup of coffee every day. But it’s going to be different for everybody. I think the best way to do it is to look at your spending and break it down into categories in terms of where your money’s going, and sometimes maybe you do that exercise, and maybe for some people, it is cutting out these frivolous, discretionary things we’re spending money on. And maybe that does make a dent, depending on how much somebody spends. But for other people, maybe that’s not the case. Brendan M.: Every day, yeah. Tom Mullooly: … every day, every day going to work, that’s $1,000 in a year. I don’t know if that would really help me getting towards my retirement goals or saving money for a house, but it’s a healthy dent on a vacation. Brendan M.: Those are the choices that you have to make. It’s like, do I want coffee and a donut every day, or do I want to go on vacation later this year? And you can approach it that way where maybe in a sense you eliminate an expense and go on vacation, rather than I think what a lot of people might do, which is to go on the vacation anyway, but to put it on the credit card. Tom Mullooly: Sure. Well, we’re getting points, right? Brendan M.: … don’t want to do it or they want to be blind because it’s easier to not know what percentage of their take-home pay goes to coffee and a donut every week, because that’s painful to find out when you add it up. Tom Mullooly: One of the early slogans that I tried for Mullooly Asset when the business started years ago was taking the lampshade off one investor at a time. That didn’t really go over very well. Brendan M.: Nobody wants to feel dumb. Brendan M.: So it’s hard. Tom Mullooly: But there is a certain amount of lampshades being worn in the business, and it’s not necessarily always the individual investor. Sometimes, it’s the advisor who wears a lampshade on their head, and they just won’t open their mind to looking at other things, or being receptive to the idea that sometimes in the business, things can change. DISCLAIMER: Tom Mullooly is an investment advisor represent with Mullooly Asset Management. All opinions expressed by Tom and his podcast guests are solely their own opinions and do not necessarily reflect the opinions of Mullooly Asset Management. This podcast is for informational purposes only, and should not be relied upon as a basis for investment decisions. 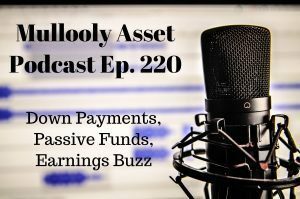 Clients of Mullooly Asset Management may maintain positions and securities discussed in this podcast. Tom Mullooly: Another article that was in the Wall Street Journal recently was the investor fever for passive funds is cooling in 2018. Again, talking about changing people’s thought patterns about active and passive, I’ve seen a gigantic shift. There was no passive investing when I got started in the business in the ’80s. There wasn’t any. It was all active. I didn’t know anything else. You bought Peter Lynch, who ran the Magellan Fund. You bought all of these guys. You bought these funds because of their track record. Now, it is completely the opposite. Brendan M.: Yeah, I think that the focus more … People get caught up in what is active or passive, but really the difference in terms of where the dollars are going is low-cost versus high-cost, and systematic versus discretionary, so you want cheap funds that are systematic. So you want to pay a low cost, obviously, and you want to know what you’re getting. Brendan M.: And that’s the difference, is that where we’ve come from, discretionary stock pickers in an active mutual fund wrapper that’s more expensive and less tax efficient than what you can get now in either an ETF or an index fund. And whether or not index means market capitalization weighted or something different, I don’t think we even need to get into, because I think that’s missing the point. Brendan M.: I think that’s the shift in pace, in terms of what advisors are looking for to put their clients into now, and what a lot of individual investors who do a little bit of digging are looking for too. And I don’t think that there’s anything wrong with that. Tom Mullooly: So the story in the Journal talks about how net inflows … This was from information that they got from Morningstar, that net inflows into US mutual funds and ETFs dropped to … not by, but dropped to a level of $3.4 billion in June. That’s just the money that came in in June, still a pretty large number. Tom Mullooly: But that was the lowest amount of new monthly money for these funds since 2014, so almost four years. For the first six months of 2018, inflows into passive type investments were down 44% compared with the same period a year ago. So is it because they’re losing favor, or is it because a lot of money that was going to move has moved? We don’t get that answer from the article. Brendan M.: Yeah, sure. Like, does it necessarily mean, the drop that you just stated, the 44% year over year, or whatever it is, does that mean that that money is going back into active mutual funds, or is it just a drop in inflows? I don’t know. There could be tons of reasons for that. Just less people with money to put to work. I’m not really … I’m not sure, I don’t know. Tom Mullooly: People looking for yield now instead, because yields are starting to come up. Brendan M.: Yeah. Like, maybe they’re keeping their money at the bank, or in a CD or something that we’re not seeing inflows. Brendan M.: And I don’t know. I’m not really sure. Tom Mullooly: But this whole active versus passive funds, I swear, Brendan. Sometimes we could do an entire podcast just talking about that. One of the things when I get pulled into these rabbit holes on Twitter, following the discussions back and forth with comments about active versus passive, I would love to just put out a poll. There’s no right answer to this question that I’m going to post. But I would just love to see the responses from everybody on Twitter. And the question would be, would you consider Warren Buffett to be an active or a passive investor? Brendan M.: Right. I think a lot of those conversations that happen on Twitter just end up being people talking past each other, because they don’t define active and passive as the same thing. So it’s tough, because what do you mean by active? Do you mean active in the sense that somebody’s picking stocks? Is it that? Is discretionary active, like the active mutual fund, or do you mean somebody who is trying to time the market, or both? Or one or the other? Brendan M.: Right, yeah. Like, is it anything that isn’t market capitalization weighted? Is that it? I don’t know. And I don’t think there are right or wrong answers, and that’s why I think these discussions persist, because people define active and passive as different things. So if you’re not talking about the same thing as somebody else, it becomes easy to think that you’re disagreeing, when in reality you may not be, or you may be to such a degree that is pretty much irrelevant. Brendan M.: Results haven’t been great. Tom Mullooly: Yeah, we’ve seen those results. They haven’t been that great. Is it worth it to pay extra for that when you can just buy the index? Brendan M.: Right. It depends too, what exposure are you getting from this discretionary manager? And in a lot of cases, it’s an expensive wrapper for them to pretty much mirror their index anyway, because they’re so afraid to lose to it by a big degree, so they don’t even make these big active bets. So if you decide you want active exposure, you want a large cap value manager for your portfolio, you think it’s a fit, then you should make sure that you’re paying for somebody that’s actually going to make those bets in such a way that it makes sense for you. You want true active exposure, you don’t want this closed index exposure that you’re just paying more and getting nothing for. Brendan M.: You might as well just own the index at that point, or Vanguard Value Fund. But if you’re going to find an actual person that’s going to do what they say they do in a concentrated way and make the kind of bets that you want to see them making and show you what their process is so you understand the exposure you’re getting, maybe that’s fine. I don’t have a problem with that. But most of the time people don’t, because a lot of these funds are crap, quite frankly, so they want the index instead, because at least it’s cheap and they know what they’re getting. Tom Mullooly: Right. To be clear to our listeners, a lot of times, they’ll hear the term “the index”, and they’ll automatically think the S&P 500 index. And that’s not necessarily the case. In fact, Eric Balchunas, who we know from Bloomberg, has pointed out several times that there is probably a fair amount of active money that is going in and out of SPY, which is the ETF for the S&P 500. But there are more and more indices being created every day that you can build ETFs off of. I think the problem is they’re running out of indices. Brendan M.: I think it’s kind of silly at this point too to just … Everything is an index now, so it doesn’t even mean something is, in my opinion, it doesn’t mean something is passive because it’s an index. If it’s an index that weights things by momentum, it’s not … I think passive means market cap weighted, plain vanilla index. That is what an index is to me, but that’s my definition of it. Some people would disagree, and that’s fine. I don’t think it matters. Brendan M.: You just want to understand what exposure you’re getting, know what you’re paying for it, and that’s how you can decide whether or not it makes sense to allocate to or not. Tom Mullooly: Good point. The headlines that we’re seeing, the last day or two, now that we’ve moved out of the second quarter and into the third quarter, now companies are going to start reporting their earnings. Brendan M.: Right. So I saw several articles over the last week here about the second quarter earnings, and basically looking at … First quarter earnings were very strong, they were up 26% over the trailing 12. So they increased, and that’s pretty significant in terms of an increase. But people were looking at … Second quarter things are expected to be strong, but maybe not as strong as the first quarter. So is that good? Are they going to be … They’re still positive, so that’s a good thing, but is it going to be bad because it’s not going to exceed the first quarter number? How are people going to react to it? And that’s more what matters. People are trying to look at this like, are the second quarter earnings going to be good enough to break us out of this range that we’ve seen the market back and forth in since basically the end of January? Tom Mullooly: Right. So to basically recap what you’re saying is, first quarter earnings were up 26%, stocks responded because they had great earnings, so people either knew it or bid them up as we went to 26% earnings gain on average. Now, the second quarter numbers are projected to be up 20%. Again, not as good, but is it good enough to surpass the expectations that people in the market have? Brendan M.: I don’t know, because the first quarter earnings were really good and the market really hasn’t gone much of anyway this year. So does it matter? Tom Mullooly: So explain to me. We had really great earnings, and the market has kind of laid an egg in the first six months. And yet I’ve seen plenty of periods over my career where the market, companies in general, have had very little in terms of earnings to show. But they’re coming out of a period of losses, and so their prior quarters were losses, so these numbers look great compared to, hey, no more future losses, let’s move on. Brendan M.: The way I like to pose it is, we’re going to get second quarter numbers here very soon. What if we had the third and fourth quarter numbers already too, and we were going to use that information to predict where the market ends the year. Would we be able to? Would that be enough information for us to make a good forecast, or would we not know still? Brendan M.: Yeah, yeah, right. Like, you change the story. And it’s like, well, we don’t have all the numbers we need, even though we have these numbers. Brendan M.: But just point being that we could have these earnings numbers for the third or fourth quarter, and they could look good or bad. And so we could make a positive or negative assumption just based on that, where the market is headed, because of those numbers. And we could be totally freaking wrong. Tom Mullooly: So before we turn the mic on, for our listeners, what we were saying … I did not know about this article from Jason Zweig. And I said to Brendan that the whole idea of the earnings release is only good for a brief moment or two, and then people are like, “Yeah, but what did they say about the next quarter?” Like, these guys that live … The guys and gals that live on these earnings releases, they’re crack addicts. Brendan M.: Right. That’s exactly basically … Jason Zweig led off his article that was about earnings surprises by saying what matters to a stock price is not how much profit the company earns, but how much it earns relative to what the market was expecting. He said, “Addicts often have to take heavier doses to get the same thrill as time passes,” just relating those points to one another, where people are always looking for more and more and more from the next earnings, in terms of the forecast, beat it or not. Tom Mullooly: But Brendan, wouldn’t you agree, if you really like Microsoft, are you going to rush out and buy more just because they beat their earnings by a penny? That was probably a made up number anyway. Brendan M.: Yeah, and that was kind of the point that Jason had, that 69% of companies since the beginning of 2009 have beaten the analyst consensus forecast. In fact, 78% did in the first quarter of 2018. So just to show, he went through the rest of his post, that basically explained that the analysts in these companies are often just pretty much in bed with one another, and they manipulate the forecast so that the company has a very good chance to beat it, because they know that that will affect the short-term stock price, or at least it has in the past. And Jason kind of wondered, is that game off? Are they going to have to continue making it … Are they going to have to beat by more because people now know that they gamed the system to beat by a penny or something stupid like that? Tom Mullooly: Right. Are they going to have to continue massaging the numbers over and over and over? Brendan M.: Yeah. And so basically, this last little blurb here that I want to share, I think was basically what to take away from it. Jason said that Wall Street’s conventional wisdom holds that when a high percentage of companies beat expectations, the economy is unexpectedly strong, or the bull market must have further to run. Don’t fall for that. With more than two-thirds of companies reporting positive earnings surprises every quarter, all you should conclude is that they are adept at conniving with the analysts who follow them. Brendan M.: Yeah. It doesn’t matter. Tom Mullooly: They didn’t buy enough donuts for everybody. Brendan M.: And Jason kind of makes that point too, maybe … So if it doesn’t matter if they beat by a penny, take that as you will and try to understand this relationship. But also understand that if they miss after trying to manufacture an earnings surprise to the upside with the analysts and they can’t come through on it, then there may be some bigger problems there, because they knew well beforehand what number they needed to come in with to beat the consensus estimate. Tom Mullooly: It could be an interesting study to see … I’m just spit balling, but it would be an interesting study to see what would happen if a company missed on their earnings, like a total whiff. What happens over the next year, two, three, with the stock? Do analysts stop covering it? Does the stock start a slow descent into a crash landing somewhere? Brendan M.: Right, they’re undervalued, and that’s one of the things people will return to with value investing that makes sense, is that people overreact to the downside, and that’s more or less what you’re getting paid to accept as a value investor. Tom Mullooly: Yeah. Well, thanks for tuning into episode 220, and we appreciate you coming to join us, and we look forward to speaking with you again on episode 221. Ep. 212 – Broker Profits, Elder Fraud, Pensions & more! Ep. 246: Is Going to College Really Worth It?